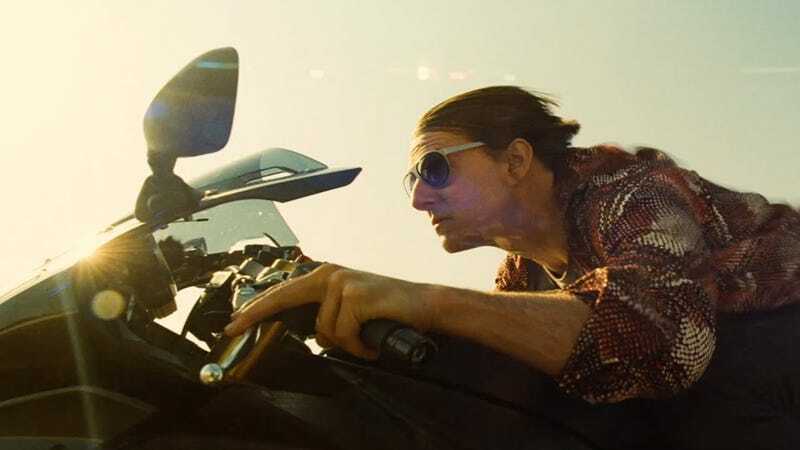 In the wake of the serious spy film wave (from the new James Bond to Jason Bourne), we’re just happy that Paramount is shifting the super-serious gears on its Mission Impossible franchise to funny. Because the new footage screened at CinemaCon today was sensational. After rolling out a confusing muddle of clips that was Terminator Genisys, it was surprisingly refreshing when mega star Tom Cruise took the stage in hopes of making the audience laugh. Yes, Mission Impossible - Rogue Nation will be laden with death-defying stunts that the studio will fall all over itself to remind the audience that yes, that really is THE Tom Cruise tied to the side of an A-400 airplane with only one wire. But let’s be real, we’d all be disappointed if that wasn’t Tom Cruise stapled to an underwater steel pipe by a jockstrap (not a real stunt yet, but there’s still hope). Bottom line, the Cruise shenanigans, while endearing and certainly impressive, only take you so far. Mission Impossible has long been playing with the idea of being the funnier (but still serious) franchise for sometime now, and the footage that premiered at CinemaCon 2015 seems to have finally pushed the team of spies into the Pixar Incredibles-type humor and it’s so great. The first scene that premiered had an up-the-nose shot of a shirtless, hairless, and really wide-chested Tom Cruise. He’s handcuffed in the traditional bad-guy basement. Enter new Mission Impossible cast member Rebecca Ferguson (playing Ilsa). The stunning and silent woman walks into the room and unpacks a collection of syringes in front of Cruise’s character Ethan Hunt. Hilarious side note: when Cruise introduced this scene, he mentioned that his character (a character he’s been playing sine 1996) was named Ethan Hunt and kind of laughed about the fact that he had to remind everyone of this. Let’s be real, Ethan Hunt is really just Tom Cruise, and it’s kind of hilarious that Cruise will freely admit to Hunt being a bit, well, not well known. Next scene, it’s a high-speed chase in Morocco. Ving Rhames (Luther) and Jeremy Renner (Brandt) are driving around looking for Simon Pegg (Benji) and Hunt. Benji and Hunt come barreling out of a building, both wearing ridiculous, loud-printed polyester shirts. Hunt is shaking, because (as we were told) a few minutes earlier he was dead. The shaky Hunt unlocks his spy car (via cool spy tech that’s actually just a touch window on the car, but it’s cool) and they start to drive, poorly. Benji is screaming and wonders if Hunt should actually be driving, but it’s too late; the chase is on. Eventually, Luther and Brandt find their teammates flooring it own a bumpy rock road. (Cruise has never looked so ridiculous, but it’s amazing.) Brandt and Luther try and catch up, but they’re driving a Land Rover, in the back alleys of Morocco. Their high speed chase slowly becomes a lesson in bad parallel parking while the two bicker at each other like an old married couple. It’s adorable. Meanwhile, Benji is just screaming and screaming and screaming and it’s great. Plus, it doesn’t hurt that the chase scene is pretty spectacular on its own right — especially when Hunt ditches the soft touch and decides the best way to get rid of a motorcycle is to run it over with his car. It really feels like Mission Impossible (which was always fairly funny) is stepping into its own and balancing action with fun. And that’s just the way we like this franchise.